If you have been living together uninterruptedly during more than 2 years, or the relationship has been formalized through a Notary, or there is a common child, then the law recognizes your situation as one of a civil partnership. On today’s post, we want to address the most relevant points to consider when formalizing a pareja de hecho. We will analyse the related legislation, the rights that emanate from it, and how do the different legal provisions incise depending on the autonomous community in which we are settled. It will be of great relevance to understand the legislation related to the civil partnership. For that purpose, and as we are located in Barcelona, we will focus on the Catalan law. Under that law, El artículo 234 del Libro II del Código Civil de Cataluña (Ley 25/2010 de 29 de Julio), states that two people (whether men or women) who share a daily coexistence, prolonged in time, thus engaged in a life analogous to marriage, can be registered as a De Facto Couple (pareja de hecho). This would be the main requirements for the fact union in Spain in 2018. Just like it occurs with many laws inside the Spanish state, placing the focus in one autonomous community or in another will radically change our conclusions. That is due to the fact that many of those autonomies in Spain have been implementing their own version. And, thus, the rights of the civil partnership differ. Nevertheless, a generality does exist. The general normative states that an individual who is a non-EU resident in a relationship with an EU citizen can get the Spanish residence permit for the long run. Have the ID’s present. In case of being an EU citizen, the NIE could be asked for. Sign a declaration in front of a notary. Apply for the residence permit, which is generally awarded for a period of 5 years. While is true that the formalization of a civil union is not a complicated process, not having the help of a specialized lawyer can delay it to a large degree. This is why at Balcells Group we take care of everything for you: we manage the contractual part and we accompany you in the whole Spanish residence permit application process. For whom is this process useful? For all those individuals that are in a long-term relationship with someone from the European Union and who also want to develop a stable lifestyle in Spain. Do you want us to help you form a civil marriage and thus getting the residence permit for the Spanish territory? Then do not hesitate to contact us now! 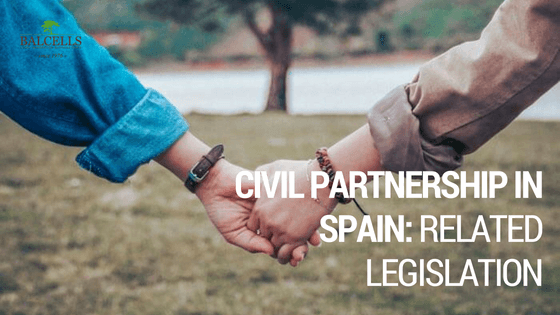 Which are the Benefits of the CIVIL UNION in Spain? If you were wondering which are the exact benefits of becoming a Pareja de Hecho in Spain, you know have it easy. We summed them all up in this video! Being able to deduct taxes together, regulating the relationship in economic terms and being protected against the law are some of the benefits that this type of marriage can provide you. We’ve been here in barcelona for more than five years. We live and share in the same apartment together. My partner has already a NIE just this year. Am I qualified to apply for Pareja de hecho? We would really appreciate if you could send us an email to info@balcellsgroup.com detailing your situation, as being qualified to apply for pareja de hecho depends on your origin country and the kind of permit you have. You’ll receive an answer as soon as possible. Hi, you can do “the pareja de hecho”, but if you want to do it for the residency card, it won’t work unless one of the two it’s European. For more information please contact us or book and appointment.